The 597ci Combo features a brilliant color 640V x 480H 4.5" display, Dual Beam sonar with 2400 Watts PTP power output, 16-channel internal GPS Chartplotting with built-in UniMap, a card slot for maps and saving waypoints and a Tilt & Swivel Quick Disconnect Mounting System. The new design also allows drop-in replacement for competitive in-dash models. 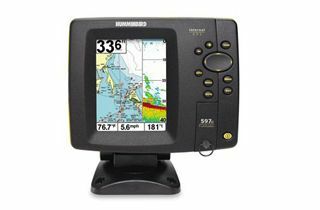 Maximize your angling experience with the Humminbird 597ci fishfinder GPS system.